Let two people interested in Photography come together and the conversation immediately veers to what lenses one has, which camera body one uses and so on and so forth! So, for all those who wanted to know what gear I use, here it is. This is what’s in my camera bag. My first DSLR was a DX, Nikon D7100 (18-105mm) DSLR Kit . It was feature loaded for its time and still is amongst one of Nikon’s bestsellers. & then sometime last year as I was shooting a night wedding, outdoors in a low light setting (totally out of my depth here) it suddenly stuck me that it was time for a Full Frame. That is when I got my Nikon D810 Body . *I would recommend that you only upgrade when you know you have outgrown your current system. I had used my D7100 for a full three years under different conditions to know exactly I was looking for. Now that I was upgrading and I pretty much knew what kind of photography I enjoyed the most, I decided not to get the kit lens and opted for this lens instead. It is a brilliant choice for shooting architecture. I am not a “digital nomad” and I only do a few big trips a year. What I do though, is to go on a whole lot of road trips, hunting down ruins, temples, forts et al. And, this lens not only gets in a lot more of that into the frame but it also gives you wonderful depth when shooting with clouds as a backdrop. So for those days, which is most of the time, this lens is the only lens I carry. The last lens I got myself was the 24-70mm as my ‘alternate primary lens’. Now, whatever that means! Also there are trips where I can only carry one lens and then there are those where I can take along all my lenses but the conditions are such that it gets tough to change them too often. For instance, shooting winter landscapes in the subzero tempertures of the Himalayas. It has in fact become my go-to lens and it rounds out my camera system perfectly. I use this lens only rarely. I can vouch for its picture quality though. It is super sharp and the background blur just about perfect. Genre of Photography | For everything else! This one is a work horse and is probably one of the most loved Nikon lenses ever. And, rightly so. I use it for just about anything from Bird Photography to Portraiture. Got this one even before I got my D810 and it works just as good on a DX body. This basic Benro tripod is the one that I have always used. 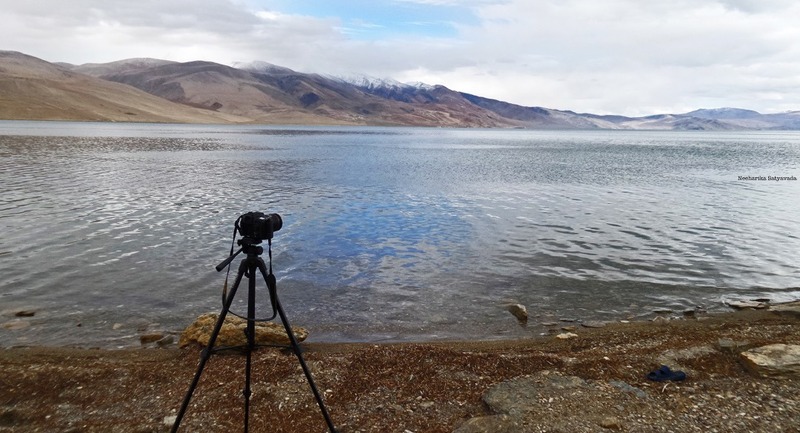 Because a sturdy, carbon fibre tripod can be used even in rough weather. For, it isn’t recommended to handle aluminium tripod legs without gloves in sub zero temperatures, also aluminium tripods are not sturdy enough in strong winds. Plus, this one is compact and lightweight too, making it ideal for Travel Photography. & yes, it fits perfectly in the side pocket of my camera bag. Sturdy. Available in India only now. Saves me the worry on those long trips entirely dedicated to photography. Also, it is safer to divide your memory into smaller units rather than risk putting all your photos and videos on one large memory card. I can never have enough of Hard Disks shooting RAW! Nikon EN-EL15 for my D810. Extreme weather conditions, far out places lacking access to electricity call for these. I have a basic Photron Lens Cleaning Kit but if don’t mind splurging a little then I would say go whole hog with the Zeiss Lens Cleaning Kit. Besides being Zeiss, this one comes with a cleaning brush and a little pouch to carry it all in. Because, I know we all love our cameras and photography is one hobby that once you are in, you just cannot seem to stop coveting the brands or forever adding to the wishlist. The Neewer Camera Rain Cover is the one accessory that I can not stop raving about! I have always just used my camera bag’s rain cover whenever I found myself stuck in a downpour while out shooting and had never really felt the need for this. And, then I got this camera rain cover as a gift and it was only after I used it in the Goa Monsoon, that I realised how much I loved it. Well, it is more of an essential rather than an extra. But yes, I use it for my Food Photography, Flatlays and whenever I want to quickly freeze a travel memory. That way I dont lose out on a moment looking for the right lens and I can still get a sweet enough background blur with the dual cameras on the iPhone 7 Plus. A mini point and shoot this one. Almost my secondary camera. Allows you to use the time-lapse and timer modes on the iphone. It was a present and I take it along on trips when I can afford to pack a little extra. For just a little behind the scenes fun! Got anything specific to ask about photography or camera gear? Let me know in the comments below. You can also get in touch with me here.